Cadillac’s CTS has come a long way from when the first previous generation sedan rolled off the Grand River assembly line in Lansing, Michigan back in 2002. Since in induction of the current generation model, the CTS has garnered acclaim as a world-class sport luxury sedan and went on to expand into a wagon, coupe, and the stellar V-Series performance lineup. But, GM had its mind on expanding the CTS lineup with the first generation and Automobile Magazine has the evidence to prove it. Evan McCausland of Automobile Magazine came across a General Motors-owned parking lot where unwanted full-scale design projects are parked until the end of days. Parked amongst the misfit vehicles laid a first generation Cadillac CTS wagon. The vehicle took some ideas from Audi’s Allroad wagon with its raised stance and large wheels. 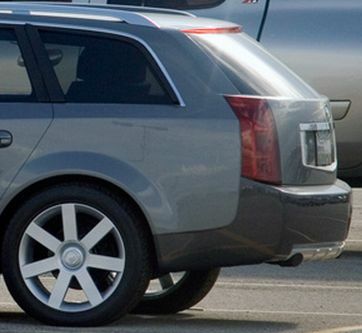 Judging by the way this vehicle looks, it’s a good thing GM decided to hold off on the CTS wagon till the current generation. For a full gallery, visit Automobile Magazine through the link below. Agreed. Now for the love of jebus make the regal wagon!!! I disagree. This first-gen CTS wagon looks fantastic. It would have looked even better if it had reached production in final form. I love the raised stance, big 18-inch wheels, and black rubber trim on the rocker panels contrasting with the polished bright-metal trim on the doors and bumpers. It reminds me a lot of the 2001-2005 Audi A6 Allroad, which my mom has a 2004 2.7Turbo and absolutely loves! And I have to agree – her Allroad is a fantastic car. Too bad that Audi discontinued the A6 Allroad after the 2005 model year. My mom would buy a new Allroad in a heartbeat, either in A4 or A6 trim. She does not like the new Audi crossovers, the Q5 and Q7, and she is not interested in the Volvo XC70 wagon or the Subaru Outback. She test-drove both and found them lacking in certain areas compared with her Allroad. Why doesn’t Cadillac at least consider the Allroad treatment for the current-gen CTS wagon with a raised stance, beefy bumpers, etc? This would definitely double sales of the slow-selling CTS wagon. By the way, I saw a euro-spec 2010-model year Audi A4 Allroad with a turbo diesel engine in Washington D.C. It looked fantastic. Unfortunately, Audi has no plans to import them to the U.S.
What a wasted opportunity for both Audi and Cadillac.